After a very mild Spring, Summer is officially in full swing. In central Virginia, summertime typically comes with a triple-digit Heat Index and an outrageous electric bill. Here are a few tips to keep your home cool without putting the AC on full blast. 1. Open windows at night and keep blinds closed during the day. 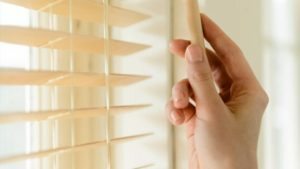 We recommend light-colored blinds since they reflect, rather than absorb the sun’s heat. It will amaze you just how cool the air at night gets in the summer. 2. Switch the direction of your fan. If you set the blades to run counter-clockwise, this causes the hot air to rise and go out (instead of just circulating hot air around the room). Such a simple fix! 3. Change your AC filters regularly. Ok, we know the title of this article says that we won’t crank the AC, but we promise that there is a way to use the AC without racking up bills. Changing out your air filter every 4-6 weeks (at least during the summer) can save you money in the long run. Remember, a dirty filter lessens the efficiency of airflow. Plus, it reduces air quality. Make sure to replace that filter! 4. 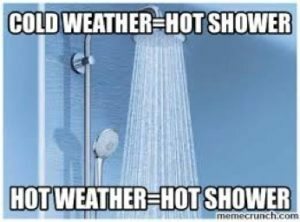 Can’t stand a cold shower? Keep your exhaust fan running. Turning on the exhaust fan while showering is crucial in the summer months. The heat from hot showers can move into surrounding areas, causing a pool of heat. The trick is to leave your exhaust fan on for 20-30 minutes longer than you normally would. Afraid that it will rack up costs? No worries, bathroom fans run at a very low cost. 5. Take advantage of the extended daylight time in the summer and turn off the lights. Turns out, all light bulbs give off heat (even environmentally-friendly CFLs) so it’s better to open those windows and let the natural light come in. 6. 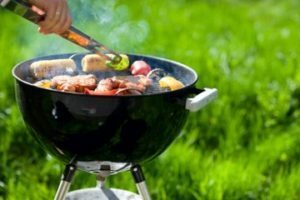 Learn how to master the grill. If you haven’t done so by now, this is the perfect excuse. Every time we use the oven to cook, it noticeably heats up our home. By using the grill, our home doesn’t get any hotter. Plus, we can enjoy these yummy recipes. Thanks on your marvelous posting! I certainly enjoyed reading it, you will be a great author.I will be sure to bookmark your blog and will often come back in the foreseeable future. I want to encourage you to continue your great writing, have a nice day! Excellent site you have here.. It’s hard to find excellent writing like yours these days. I really appreciate individuals like you! Take care! !